The man pulled out a silver-plated semi-automatic handgun and fired several shots into an area crowded with people, the department said. The deputies shot him. A man who was told no more tickets were available for an Ice Cube concert at a racetrack was shot by a sheriff's deputy after he fired his gun into a crowd, the San Diego Sheriff's Department said. 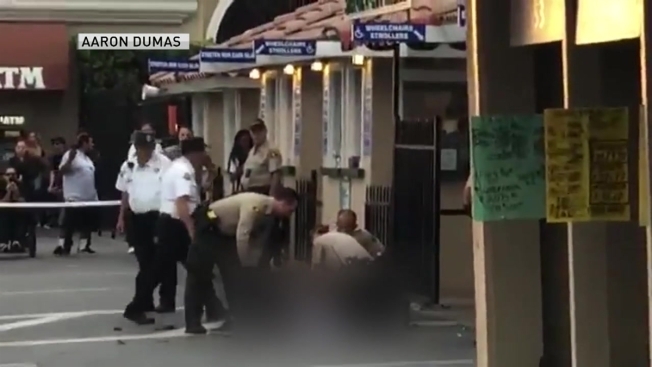 The man, identified Monday as 22-year-old Daniel Elizarraras, of Escondido, approached the ticket window at the Del Mar Fairgrounds about 6:40 p.m., the department said in a news release. Shortly after, he was told there were no more tickets, an argument ensued and nearby deputies came to the scene. The man pulled out a silver-plated semi-automatic handgun and fired several shots into an area crowded with people, the department said. The man was taken to Scripps Memorial Hospital La Jolla, the department said. Details about his condition were not available Monday. It appears no one else was injured, the department said. In a tweet Monday, Ice Cube said: "I feel bad for the people who left the show, but I totally understand. Moral of the story: Come see ya homie Cube...but leave the strap at home." A video of the shooting that was posted on Twitter records the sounds of several shots being fired before a man falls to the ground. Two deputies appear to holster their guns as one shouts at a gathering crowd to "get back, get back, get back." Passing concert-goers can be heard shouting expletives after the shooting. In a broadcast of the track's final race of the day that was posted on Twitter, an announcer can be heard saying, "There's gunfire at the track," as horses move along the turf course, the Union-Tribune reported. At 7:22 p.m., the Del Mar Racetrack tweeted that the "situation has been contained" and said the concert "is moving forward as planned." Associated Press writer Michael Balsamo contributed.